…and all through the house, not a creature was stirring, not even a mouse…. As my Christmas Eve winds down and I get ready to go to bed and prepare for Christmas Day, I thought I would share some pictures from my day. If you saw my cookie post from yesterday, I mentioned that I was going to try to make yet another cookie today if I had time. I had some time this afternoon so I was able to make them! They are essentially chocolate chip cookies but instead of regular chocolate chips, I used white chocolate chips and instead of walnuts I used pistachios. 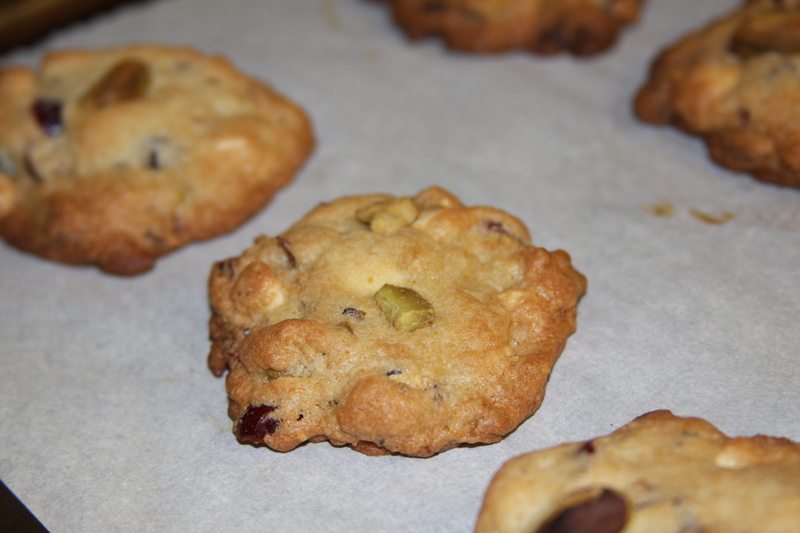 Then, I also added dried cranberries so they were red, green, and white – aka the ultimate Christmas colors. I got the idea from this site via Pinterest. Unfortunately, my pistachios weren’t as vibrantly green, but I worked with what I had! My brother holding the cookie he bit into. You can get a pretty good glimpse of all the colors. A glimpse at my Christmas Eve dinner, which consisted of shrimp cocktail, and potato & onion dish my mom is famous for, brussel sprouts, corn, asparagus, yorkshire pudding, and prime rib. For dessert (besides cookies) a homemade chocolate mousse pie, and lemon mousse cake. Now, I’m relaxing, watching some Christmas movies before bed in my awesome Christmas onesie! Merry Christmas, Lena! I saw you posted about a giveaway but haven’t gotten a chance to enter yet, but I plan to! Did you get your candles yet?